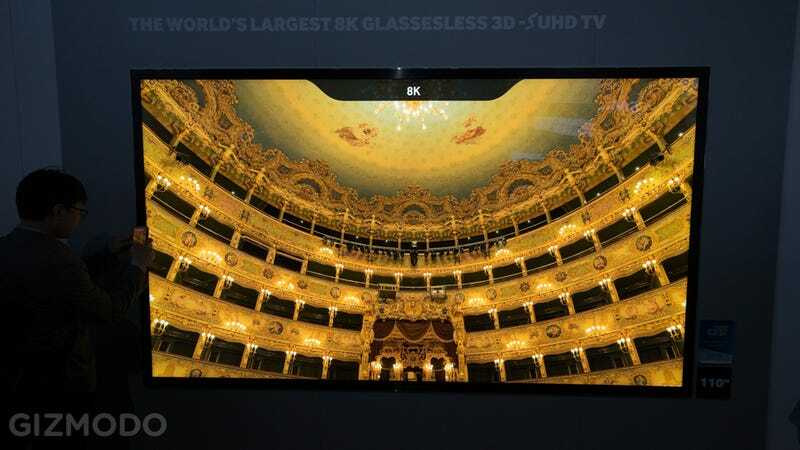 Since we last checked-in on Samsung's 8K television prototype a year ago, the technology has progressed considerably. The new model that Sammy is showing off at CES is a huge 110-inch monster. Its resolution is even more infinite than I remember it. And then, they switched on the glassesless 3D and I almost threw up on myself. Indeed watching 8K footage was really amazing,even if it's a technology that's so far away in the future that it's hard to think about right now. I mean, come on, 4K is just now starting to get to the point where people can afford it. This prototype was about more than the 8K resolution though. It was also an illustration of how that resolution might be harnessed for glassesless 3D effect. 3DTV that requires glasses is basically dead, but that hasn't stopped manufacturers from experimenting with tech to create 3D effects without the clunky glasses. You can't fault a company for experimenting but after looking at this 3D, I felt sick. Sure of the image popped out of the screen, but overall, it sort of felt like I was drunk. Only little bits of the image were in focus, and the overall picture looked warped and wacky. I felt dizzy. I wanted to look away. Though this product isn't supposed to be mainstream, it perfectly illustrates what we've learned in the last couple of years about televisions. Higher resolution televisions can inspire awe. 3DTV? Well, no thank you.